I spent the days beginning with ‘S’ milling around Wizards training camp this past weekend. Media is only given access at the very end of practice. I basically got to see the team shoot free-throws on Saturday, and the end of situational scrimmaging on Sunday. Once practice is over, we’re allowed down on the floor for interviews. On each day, Flip Saunders was the first to come over and was very personable and gracious in answering whatever question was thrown his way. After that, we just try to catch the players as they emerge from the training room … most glad to stop and talk for several minutes, and a few opting to talk on the move as the media guys tried to keep up. No one dare approach Gilbert Arenas on either of those days lest he run away screaming, “No media, NO!,” possibly hurting himself in the process. Unfortunately, because of some personal travel between the days, I wasn’t able to post as much as I would have liked. Below are some of my notes/observations/comments/quotes from those two days. On the contrary, this year I’m thinking teams (and Hollinger) will sleep on Haywood’s jumper and he could really be a dangerous threat … if left open. On Saturday, I asked him about it. Brendan said he worked on the mid-range a lot this summer (evident by his video with the Hoops Whisperer), so he’s feeling more comfortable taking them from the 15-foot range. He also feels the coaching staff wants him to have confidence taking those shots. 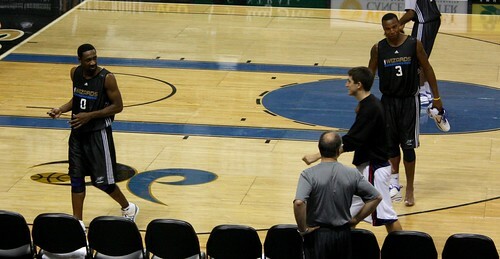 The last scrimmage of Sunday featured heavy doses of Mike James running the point and Gilbert Arenas play off the ball. 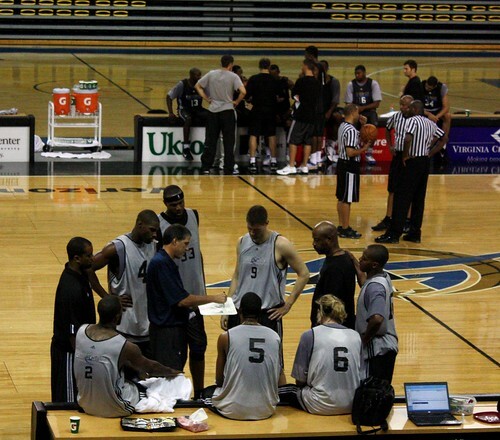 This black squad also featured various combinations of Young, Butler, Blatche, and McGee playing with those two. Now, the media was let into practice after Caron evidently went out. But even when he came back, Saunders continued to run through several situational scenarios (around 30-40 minutes worth) while keeping James and Arenas together in the back-court. Make of that what you will, but it certainly seems like something to think about. On Saturday I spoke with Nick Young about his offensive role. He shed a little light on how the back-court rotation might play out. Nick also said that at times, he finds himself reverting back to the “old” Nick Young, but is really trying to focus on the Richard Hamilton/Reggie Miller-esque role Saunders has given him. For being known as a coach who gave ‘tough love’, Eddie Jordan allowed a pretty loose locker room. Part of the locker room dynamic is a reflection of how the players get along and interact with each other off the court. On media day, Haywood dubbed himself and Gilbert Arenas as the “blenders” of young and old in the locker room (and seemed to reference how that was missed last year). Curious to see what Caron Butler thinks as a well-respected vet, I asked him about the importance of off-the-court interaction and if it’s now different from the past. “We did a lot of things before as a team off the court on our own, but just something a little more supervised (in reference to how it is under Flip now) … Getting together and doing karaoke. Getting together and being hypnotized. Going on walks to sports bars and just interacting with each other so much. I know a movie is going to come up pretty soon … as soon as they come out with another ‘gladiator’ type movie, I know we’ll be going to see that. I’m really getting the sense that Saunders “gets” today’s generation of basketball players. Sure, the old school staunch methods of someone like Jerry Sloan seem to stand the test of time. But the fact that Saunders uses modern techniques as teaching tools keeps what can be a monotonous basketball learning process interesting. It also shows that he knows how to relate to his players, which can make it easier to translate into success. Coach Flip Saunders said he would try to reduce the minutes for Jamison and Butler, who averaged 38.2 and 38.6 minutes per game respectively, last season. Saunders said that is possible with a deep team, with players who can swing between multiple positions. He has tinkered with several different lineups this week in Richmond, using a big lineup that featured Jamison, Blatche, Haywood, Miller and Arenas; playing Arenas off the ball; Butler at shooting guard and even Nick Young at small forward. On Saturday, there were multiple reports that Jamison was on fire and determined not to let his team lose any of the scrimmages. Flip said he looked like the old AJ from his 50 point Golden State Warrior days and praised his work ethic. In regard to how he treated Jamison when he coached against him, Saunders indicated that guys like Kevin Garnett, who have both quickness and length, give Antawn the most trouble on defense. I imagine a lot of teams treat Jamison in this regard. The Huddle: Black vs. White. …before he steps on the court, Miller may have to get a new pair of shoes. Unaware of the Wizards’ rivalry with Cleveland, Miller has been wearing LeBron James’s signature sneakers during training camp. You already know that’s trouble. Miller has been wearing Adidas since he was a sophomore in high school but switched to Nike after signing a contract with them this summer. He’s been urged by Deshawn Stevenson, Caron Butler and Antawn Jamison to wear any pair but the ones donned by the could-be King.